Last Yoik In Sami Forests? The conflict between forestry and nature conservation in Finland has been constant during the last 20 years. The traditional, freely grazing reindeer herding, dependent on old forest growth, has been losing its resources but complaints and protests haven’t been able to stop this process. In 2005 Sami reindeer herders made an alliance with Greenpeace and established a Forest Rescue Station in the wilderness of Inari. The international pressure from Greenpeace made Finnish forest company Stora Enso stop buying the wood from conflict areas. Kalevi Paadar, a Sami reindeer herder, lodged a complaint to the UN Human Rights Commission. He claimed that logging in his home village violated their right to continue their traditional way of reindeer herding based on free grazing. The UN asked Finland to stop logging. 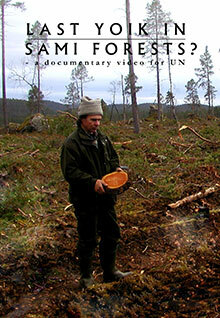 Yet, in 2007 Metsähallitus started logging again, this time in the wilderness of Kessi.